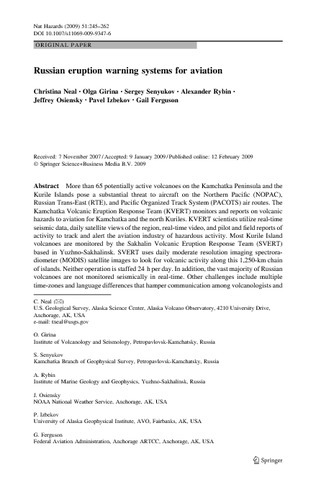 Neal C.A., Girina O.A., Senyukov S.L., Rybin A.V., Osiensky J., Hall T., Nelson K., Izbekov P. Eruption warning systems for aviation in Russia: a 2007 status report // 4th International Workshop on Volcanic Ash. Natural Hazards. New Zealand. 2007. 2007. P. 1-7. Neal C.A., Girina O.A., Senyukov S.L., Rybin A.V., Osiensky J., Izbekov P., Ferguson G. Russian eruption warning systems for aviation // Materials of ISTC International Workshop “Worldwide early warning system of volcanic activities and mitigation of the global/regional consequences of volcanic eruptions”, Moscow, Russia, July 8-9, 2010. Moscow: ISTC. 2011. P. 29-47. More than 65 potentially active volcanoes on the Kamchatka Peninsula and the Kurile Islands pose a substantial threat to aircraft on the Northern Pacific (NOPAC), Russian Trans-East (RTE), and Pacific Organized Track System (PACOTS) air routes. The Kamchatka Volcanic Eruption Response Team (KVERT) monitors and reports on volcanic hazards to aviation for Kamchatka and the north Kuriles. KVERT scientists utilize real-time seismic data, daily satellite views of the region, real-time video, and pilot and field reports of activity to track and alert the aviation industry of hazardous activity. Most Kurile Island volcanoes are monitored by the Sakhalin Volcanic Eruption Response Team (SVERT) based in Yuzhno-Sakhalinsk. SVERT uses daily moderate resolution imaging spectroradiometer (MODIS) satellite images to look for volcanic activity along this 1,250-km chain of islands. Neither operation is staffed 24 h per day. In addition, the vast majority of Russian volcanoes are not monitored seismically in real-time. Other challenges include multiple time-zones and language differences that hamper communication among volcanologists and meteorologists in the US, Japan, and Russia who share the responsibility to issue official warnings. Rapid, consistent verification of explosive eruptions and determination of cloud heights remain significant technical challenges. Despite these difficulties, in more than a decade of frequent eruptive activity in Kamchatka and the northern Kuriles, no damaging encounters with volcanic ash from Russian eruptions have been recorded. 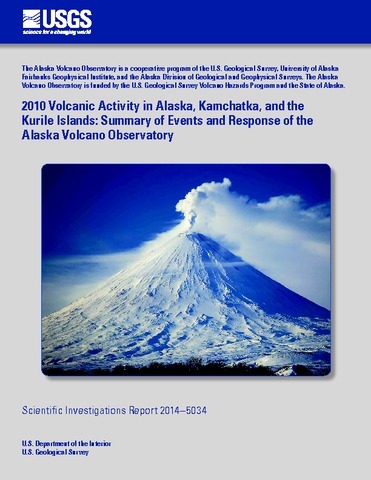 The Alaska Volcano Observatory (AVO) responded to eruptions, possible eruptions, volcanic unrest or suspected unrest at 12 volcanic centers in Alaska during 2010. The most notable volcanic activity consisted of intermittent ash emissions from long-active Cleveland volcano in the Aleutian Islands. AVO staff also participated in hazard communication regarding eruptions or unrest at seven volcanoes in Russia as part of an ongoing collaborative role in the Kamchatka and Sakhalin Volcanic Eruption Response Teams. Neal C.A., McGimsey R.G., Girina O.A. 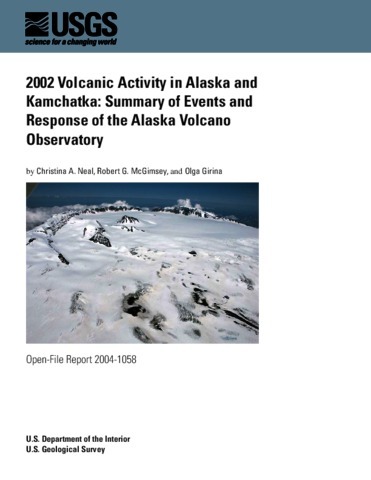 2002 Volcanic Activity in Alaska and Kamchatka: Summary of Events and Response of the Alaska Volcano Observatory // Open-File Report 2004-1058. 2004. 55 p.
Analysis of paleomagnetic variations along parallel sections across the Holocene soil-pyroclastic cover of Ма1уĭ Semyachek Volcano in Kamchatka has shown that directions of magnetization were similar during а period of 350 — 6000 В.P. This proves that magnetization is primary and applicable for reconstruction of the history of the Earth's magnetic field. 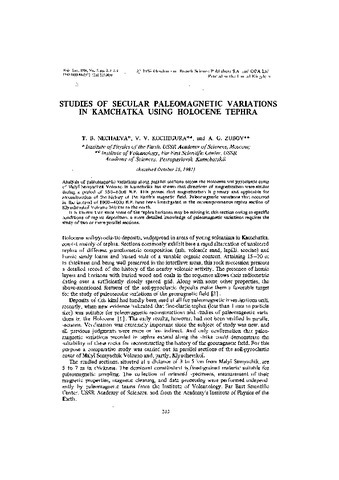 Paleomagnetic variations that occurred in the interval of 1000 — 4000 В.P. have been investigated in the contemporaneous tephra section of Klyuchevskoĭ Volcano 240 km to the north. It is known that since some of the tephra horizons may be missing in this section owing to specific conditions of tephra deposition, а more detailed knowledge of paleomagnetic variations requires the study of two or more parallel sections. Проведено сравнение палеовариаций магнитного поля Земли, полученных по параллельным разрезам голоценового почвенно-пирокластического чехла вулкана Малый Семячик на Камчатке. Показано, что в интервале возраста 300 — 6000 лет назад наблюдается подобие изменений направления остаточной намагниченности подтверждающее первичность этой намагниченности и пригодность ее для реконструкции истории геомагнитного поля. Палеовариации, выделенные для интервала 1000 — 4000 лет назад, прослежены в одновозрастных слоях в 240 км к северу, в разрезе тефры Ключевского вулкана. Выяснено, что вследствие связанной со спецификой формирования отложений тефры возможности выпадения из разрезов отдельных горизонтов для получения достаточно детальной картины палеовариаций необходимо изучение двух или более параллельных разрезов. Рис. 6, библ. 3 назв. 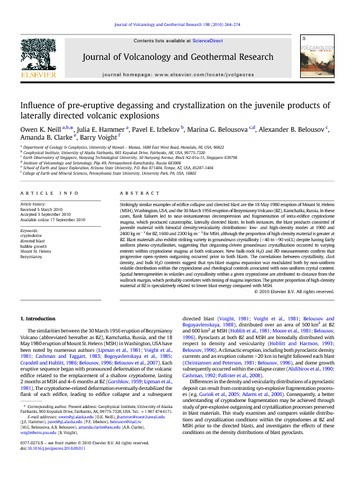 Neill Owen K., Hammer Julia E., Izbekov Pavel E., Belousova Marina G., Belousov Alexander B., Clarke Amanda B., Voight Barry Influence of pre-eruptive degassing and crystallization on the juvenile products of laterally directed volcanic explosions // Journal of Volcanology and Geothermal Research. 2010. V. 198. № 1-2. P. 264-274. doi:10.1016/j.jvolgeores.2010.09.011. 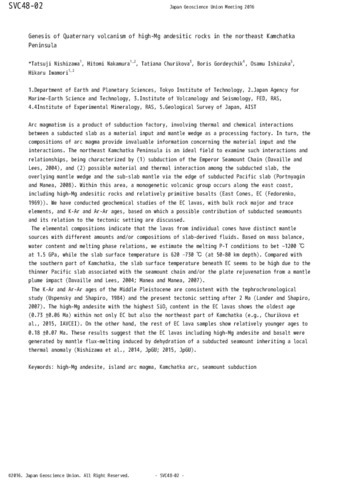 Nemoto T. Geologic and petrologic study of the Central Kurile Islands, VI - Dzigoku Volcano, Urup Island // Bulletin of the Volcanological Society of Japan. 1937. V. 3. № 2. The northeast Kamchatka Peninsula is characterized by unique tectonic regimes: (i) the triple junction ~30 km off the east coast , (ii) subduction of the Emperor Seamount Chain , and (iii) possible asthenospheric flow between the mantle wedge and the sub-slab mantle via the edge of subducted Pacific slab . Within this area, a monogenetic volcanic group occurs along the east coast, including high-Mg andesitic rocks and relatively primitive basalts (East Cones, EC ). We have conducted geochemical studies of the EC lavas, with bulk rock major and trace elements, Sr-Nd isotopic compositions, and K-Ar and Ar-Ar ages, based on which a possible contribution of subducted seamounts and its relation to the tectonic setting are discussed. The elemental and isotopic compositions indicate that the lavas from individual cones have distinct mantle sources with different amounts and/or compositions of slab-derived fluids. Based on mass balance, water content and melting phase relations, we estimate the melting P-T conditions to be ~1200 ℃ at 1.5 GPa, while the slab surface temperature is 620 – 730 ℃ (at 50-80 km depth). The Sr-Nd isotopic compositions is close to Late Cretaceous Emperor Seamount Chain, especially Detroit . The K-Ar and Ar-Ar ages of the Middle to Late Pleistocene are consistent with the present tectonic setting after 2 Ma . and its relation to the tectonic setting are discussed. plume impact (Davaille and Lees, 2004; Manea and Manea, 2007). thermal anomaly (Nishizawa et al., 2014, JpGU; 2015, JpGU). えられる（Davaille and Lees, 2004; Manea and Manea, 2007）. ラックス溶融によりもたらされた（西澤他, 2014, JpGU; 2015, JpGU）.